This is another classic combination: it’s also an enduring favourite of mine. I’m a confessed fanatic of hollandaise sauce so I think this recipe was bound to find it’s way up here sooner or later! I’ve told you already about my love of of the best to crisp up, it colours quite easily and also has a delicious layer of fat underneath which melts in your mouth alongside the crunchy skin. The sumptuous oily flesh is offset perfectly by the vinegary tang of the sauce. 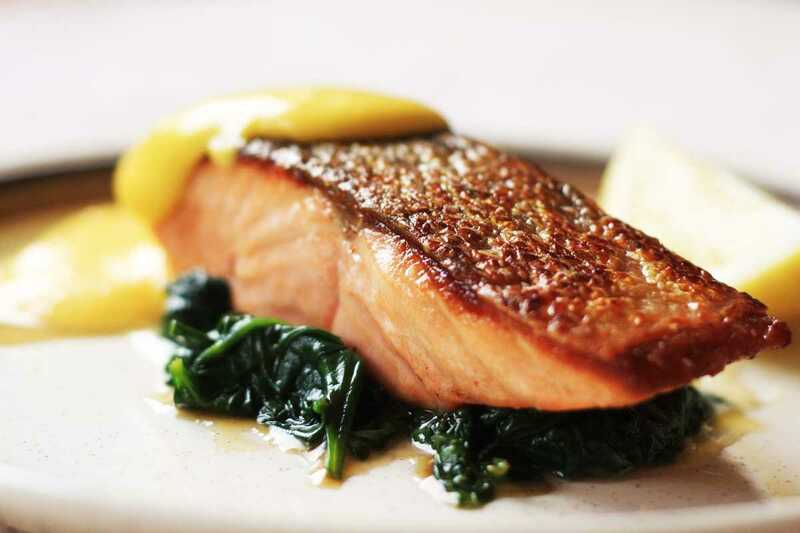 I like to sit the salmon fillet on a bed of spinach sautéed with a little garlic, it complements the other strong flavours in the dish, and adds a nice bit of colour too. Make the hollandaise: Make some reduced vinegar by boiling the white wine vinegar with the peppercorns, tarragon and mace, and reduce by half. Strain and pour back into the bottle. You’ll only need 1 tablespoon for the hollandaise but you will have a supply for next time! Melt the butter over a gentle heat. Separate the milk solids from the clear stuff and set aside in a warm place. Whisk the yolks in a bowl with 1 tablespoon of your reduced vinegar over a large pan of simmering water until it’s very thick, but be careful not to scramble the eggs. Now take it off the heat and gradually whisk in the clarified butter. Finally, add some salt to taste along with some freshly squeezed lemon juice, and more vinegar reduction if needed. Get a pan smoking hot and add about 2 tablespoons of vegetable oil. Season the skin of the salmon generously with salt, then place skin side down in the hot pan, pressing down to set it flat. Turn the heat to low and cook like this until almost half cooked. Place in the oven for about 2 minutes, until it’s almost cooked through. Meanwhile sauté the spinach and garlic in butter. Now place the salmon back over a high flame and add a knob of butter. Allow the butter to brown slightly, add a squeeze of lemon juice and baste. Place the salmon on the spinach, pour the sauce over and enjoy.